Apple Music's boss has some interesting thoughts on curation that offer a sneak peek at Apple TV's future. This week, Taylor Swift gave us some insight into her infamous open letter to Apple—she wrote it frantically at 4 a.m.—and now Apple Music leader Jimmy Iovine is spilling Apple’s side of the story. Iovine is currently doing a publicity blitz in England, where he told the London Evening Standard that Apple’s response to Swift’s letter was a little more laidback than you might think. Eddy Cue, Apple’s senior vice president of software and services, called Iovine on the Sunday morning Swift posted her letter to Tumblr. Iovine called Scott Borchetta, the boss of Swift’s record label, Big Machine, then conferenced with Cue and Apple CEO Tim Cook. The trio decided to reverse its stance on paying artists royalties per stream during Apple Music’s free three-month trial, and that was the end of it. 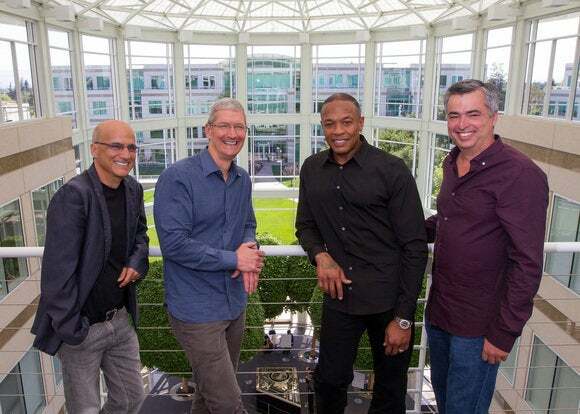 Jimmy Iovine, Tim Cook, and Eddy Cue (pictured here with Dr. Dre) decided to reverse Apple Music’s stance on loyalty payments quickly. Iovine has long trumpeted human curation over algorithms when it comes to streaming services. Curation was the secret sauce in Beats Music, which never racked up many subscribers (a few hundred thousand compared to Apple Music’s 11 million), but clearly won over Cupertino execs. 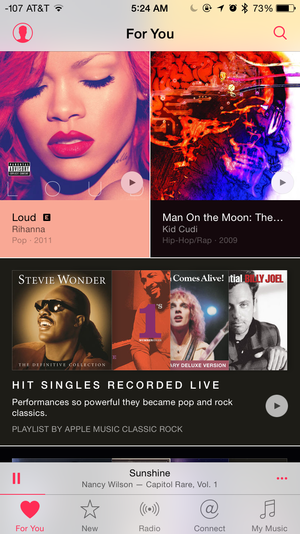 Apple Music’s playlists are curated by hundreds of editors, Iovine said. Of course, Apple Music relies on algorithms to some extent, but the company employs hundreds of editors to curate the playlists it recommends to you based on your likes and iTunes purchases. While everyone is busy comparing Apple Music’s subscriber numbers to Spotify’s or wondering whether Tidal owner Jay Z will make his music (and his musical partners’ new work) exclusive to his struggling service, Iovine is focused on the bigger picture. Those other forms of entertainment could include television, which Iovine had some surprising thoughts on in another interview with Wired UK. Apple TV is about to get a reboot that may include a streaming service. But none of the TV streaming services get it right, Iovine continued. Iovine has no plans to switch gears from music streaming to TV streaming, but his thoughts on curation could signify that Apple as a company is putting a lot of thought into how TV could be better with more humans behind it. If rumors prove true and the refreshed Apple TV set-top box we’re expecting this September includes a streaming TV bundle, it might take a few cues from Apple Music—more emphasis on people and less on algorithms.